Love peaches or just want an ah-mazingly yummy recipe? 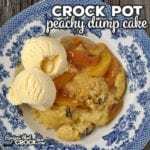 Try out this Crock Pot Peachy Dump Cake! This is so yummy, I might add it to my list of must-make recipes for Thanksgiving!